Our school is located here. Unesco International Heritage Site since 1996, Alberobello is the most famous city in Apulia and the only city made up entirely of “Trulli”. What are Trulli? A Trullo is a strange house, due to the conical roof and cylindrical shape, built using just polished drystone. These constructions, that seem spawned from the mind of a fantasy writer, were once the typical home for peasant families in Alberobello. The oldest Trullo discovered yet dates back to the 16th Century, but the origin of the Trullo is far more ancient. The construction technique was already known in Ancient Greece, (check out Agamemnon’s tombstone in Tholos). It then spread to other Mediterranean countries with the passing of time, finally arriving in Apulia. To this day, just in the centre of Alberobello, there are close to 2000 Trulli and many others are scattered among the countryside: sometimes left abandoned as fascinating ruins, of which some are transformed into wonderful holiday homes equipped with a swimming pool. If you want to learn more about how Trulli were born and the history of Alberobello, come visit us and we’ll tell you all about it! 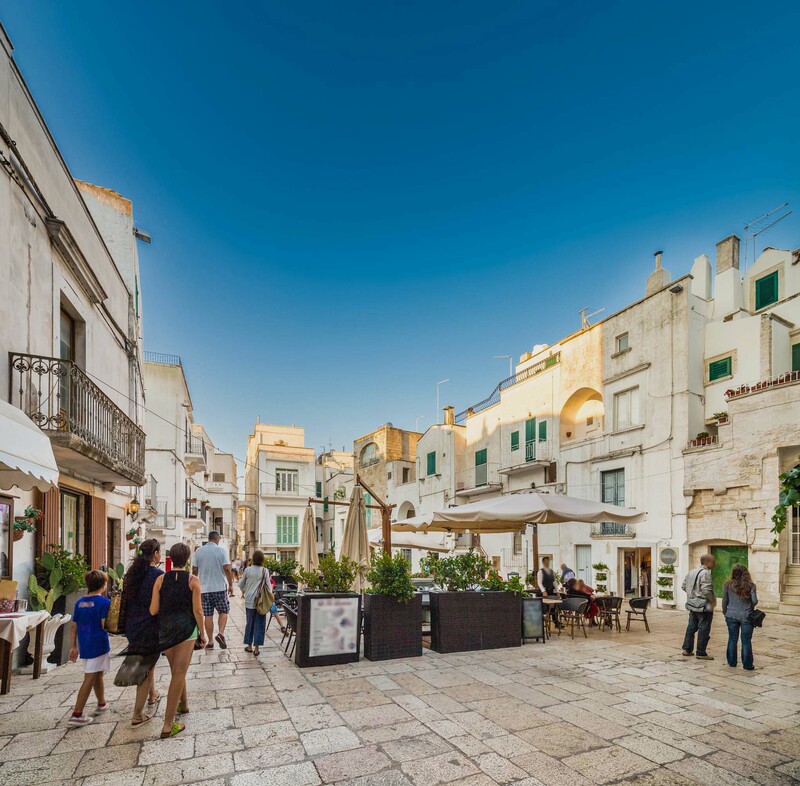 After the lesson, it’s time to relax and wander about Alberobello… you’ll be able to head up Rione Monti, famous for its Trulli and artisan shops, arriving at the Trullo-designed church of Saint Anthony (Sant’Antonio). From here, stroll back down, approaching the less-touristic Rione Aia Piccola: the silence of its alleyways and Trulli will instill in you that authentic atmosphere that once was Alberobello. After passing Piazza del Popolo, invaded by swallows in typical festive spirit, stop for sunset at the Belvedere to experience the classic view of all of Alberobello’s Trulli and get ready for a memorable photo. You should then visit “La Casa d’Amore”, one of the town’s first houses, “il museo del Territorio”, with its beautiful collection of artisan/farming tools, the neoclassical church of “San Cosma e Damiano”, and finally, the two-floor “Trullo Sovrano”, considered the tallest and most majestic Trullo in Alberobello. Alberobello and Itria Valley (being Locorotondo, Martina Franca, Cisternino) are collectively considered the “happy place” of Apulia: low prices, clean air, zero crime, a relaxed rhythm of living and a culinary tradition which is something to be envied! In fact, Apulian cuisine is one of the tastiest and richest in Italy. We’re famous for our “orecchiette” (a typical local pasta), “taralli” (a delicious savory treat), and above all for mozzarelle, cheeses, meat and fish dishes as well as exquisite organic vegetables grown by local farmers. The summer is possibly the best period to enjoy Apulia. Bars and pubs come to life, with live music and outdoor seating in the streets of the centre, whilst there are also many classical and electronic music festivals, as well as traditional events which colour the summer in Apulia. After all, the people of Alberobello are famous for being warm, welcoming and generous with foreigners, as here a guest is considered “sacred”! Far away from touristic Tuscany, Rome or Venice, imagine a land surrounded by two seas, still unexplored, tranquil, covered in ancient olive trees, heavenly beaches, artistic heritages like no other in the world and home to the best food in Italy. With the right distance from the crowded beaches, our school is situated in the centre of Apulia, making it a superb strategic position for exploring. Just a few minutes away by car, having a dip at one of the wonderful beaches of the Torre Canne Reserve or in the blue sea of Monopoli, (20 minutes away), will seem mandatory. Moving inland, you’ll be able to explore the delightful white villages of the Itria Valley, considered to be the most beautiful villages in Italy: Locorotondo, Martina Franca and Cisternino, (15 minutes away). If you’d like to eat seafood one day, we advise you to try Monopoli, (30 minutes away), the enchanting and relaxing fishermens’ town. In the afternoon, proceed through to the famous Polignano a Mare, a city dramatically perched upon vertical cliffs by the sea. Furthermore, allow yourself to be inspired by Ostuni, (40 minutes away), Apulia’s white pearl, a unique spectacle due to its white houses and vast stretch of ancient olive trees! Just one hour away, you’ll be able to visit two unforgettable cities, both International Unesco Heritage sites: Matera, the world’s most ancient town with its cavern-homes, European cultural capital of 2019, and Lecce, considered the “Florence of the South”, famous for its Southern-Baroque architecture and welcoming population.